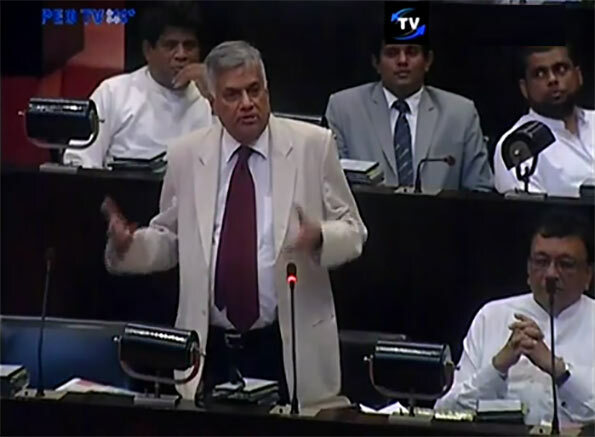 Prime Minister Ranil Wickremesinghe yesterday, in Parliament, lashed out at the media, accusing them of promoting racism. The Prime Minister was participating in a debate at the time of adjournment of the House on the recent incidents in Embiliptiya and issues involving the police. “There are problems as regards police the world over. Following police shooting in Ferguson in the US, people took to the streets against it. Similar incident happened in England last year. Police have to maintain law and order. Recently, we saw such problems here. Embilipitiya incident is only one of them. The other incident was with regard to the conduct of officers at the Kotadeniya Police station. That has been investigated and courts of law have been moved. If the police have done anything wrong, we have no intention of covering up their wrongdoings. We all came here after fighting for the need for restoring the rule of law. The British instituted the police here. Within 30 years of establishing the police in Britain, they established the police here. It is not only the police who are involved in maintaining law and order. Courts of law, the police and the media are needed for that purpose. Courts were established in Sri Lanka in 1835. Sri Lanka was the first country in Asia and Africa to have a modern judicial system. We have forgotten that tradition. We have a similar history as regards the media, too. All these institutions are needed for maintaining the law and order and to restore the rule of law. The police cannot perform that task single-handed. What we have witnessed during the last ten years was that disintegration of those three institutions and the politicization of them. The Rajapaksa regime destroyed all those three institutions. We fought against it. We need to modernise them. We have sought the assistance of Britain and other countries. We have to increase the salaries of the workers in those institutions. There was a time that Sri Lanka had the best police in the Asia. That was soon after the Second World War. Now, what do we have? We have to regain that position. We had an exemplary judicial system. All these institutions have been destroyed. Politicians got the police and army to kill people. We have to investigate those instances. We have to probe the shortcomings of the police. The Embilipitiya incident is now before the court which would give the final decision. When we freed the judicial system from undue political interferences our action was welcomed. We are cleaning up the police and judiciary. We cannot establish a new court or new police department. I know what people need whether they live in the South or the North. I have been to those parts of the country. We have to probe incidents which warrant investigations. Intelligence operatives once brought Ven. Galagodaatte Gnanasara to Sirikotha. People were also brought there to attack me. It is no use criticizing the police for those mistakes. Police personnel, too, know those actions were wrong. That was why the majority of police joined us to reject the previous regime on Jan. 08. One could be Sinhala or Tamil, but one has to keep in the mind that we all have to come together and clean up those institutions. We should not forget that family members of our MPs and one of our female MP, too, were taken into police custody. We should introduce remedies where they are needed. But, what we witness today is a witch hunt against the police. The media is engaged in it. There were reports of notebooks being grabbed from media personnel in Embilipitiya. Who is this Jayantha Nanayakkara? Where was he when Eknaligoda was abducted? Did he utter a word when Lasantha Wickrematunga was killed? (Looking at the press gallery) Tell me please whose pocket Nanayakkara is in? Those who are attacking me should answer my question. He, too, is one of the hunters. He now is raising some other issues to cover up his past. Journalists who fought for media freedom, members of the civil society and attorneys-at-law can come forward; I will come with police so that two sides can discuss the matter. If you say there has been no wrongdoing on the part of the media, I will go to courts. If you are going to courts, you need to go with clean hands. There is an editors’ guild. What did it do when the Uthayan newspaper was attacked? If you are going to courts now against police, we too could go there. I could give an affidavit mentioning what the editors did in the past. There is one editor who carried tales against a fellow journalist and got the previous regime to abduct the latter in a white van. I intervened to save him. This incident is known to the editor and his colleague. I call upon the newspapers to clean up the mess in their institutions. I tell them that their hands are not clean. If there is a violation of law, the journalists could go before courts and file a fundamental rights case. We, too, can come. Otherwise, we can talk and sort this out. But, do not engage in witch hunting. That is wrong and I am opposed to it. The Police commission and the police department should work together. (Looking at the press gallery again) Tell me now whether you are going to hunt the courts, too. Are you going to criticise the courts? Have you been able to write a single editorial on what happened at the Homagama Court? When is Lankadeepa is going to write that editorial? When is Divaina going to write that editorial? When is Lakbima going to write an editorial on that? Don’t talk big because your hands are not clean! What are you doing with regard to racism? I mean all newspapers. I am telling this to the Rivira, too. I am asking the electronic media? What have you to say about the incident at the Homagama Court? Write an editorial if possible on the Homagama incident. We, too, have a right to talk of Buddhism as Buddhists. It is we who follow the teaching of the Buddha to the letter not the journalists. We always say, ‘Buddhamn Saranam Gacchami, Dhamman Saranam Gacchami and Sanghan Saranam Gacchami’. Those who said Mahinda Saranam Gacchami have no right to talk of Buddhism. What happened at the Abhayaramaya yesterday? Some 20-30 persons came there. How many journalists were there? Now, they want to go for street fights. I can bring hundreds from Colombo to counter them. We can bring thousands of them. Don’t think that people power could be undermined by the power of the former regime. If you think that you can whitewash the previous regime and resurrect it you are mistaken. The Bar Association of Sri Lanka has issued a statement with regard to the Homagama incident. How many media organisations talked of that incident? There is one Keerthi Warnakulasuriya of the Divaina shouting that the war heroes are being killed. What did they say about the Eknaligoda abduction. Who is Eknaligoda? Is he a politician? Eknaligoda was a journalist. What is the position of media on the Eknaligoda abduction? (Looking at the press gallery) I call upon media to reveal to the country their position on Eknaligoda. I am asking each one of you. I would ask this question again. Who is Eknaligoda? Is he not a journalist? Is it right that he was abducted? I ask that question from Divaina. Is Ekanligoda a frog like Keerthi Warnakulasuriya or a journalist? I ask the same question from Lankadeepa. I ask it from Ada newspaper and from the Daily Mirror. What is your position with regard to Homagama incident? Do you approve of scolding Eknaligoda’s wife at the Homagama court? Our MP Hirunika, too, was taken into police custody. You can report this in the Rivira and on Derana TV. There is Chathura at Derana. His problem is that he, too, was a member of the hunting party. Madhawa Madawala and Chathura joined others to ruin that place with the help from the Rajapaksas. We know that you all are getting ready to promote racism. Anyone could collect some pieces of paper and open a press and print a newspaper. We have no problem with that. But, the media belongs to the people. We cannot let you use media to promote racism. Now, there is a campaign against celebrating the Independence Day. Stop that game right now! Chathura is like a Reeri Yaka. Please publish the entire speech of mine. I am asking whether Derana has two standpoints. They should response to this. Do not go on promoting racism. We have information about the Abhayarama discussion yesterday. We are ready to counter that. There are two groups of journalists. There is a group that fought for media freedom. Victor Ivan, too, has blamed me. We fought together. If those who went hunting try to pose as clean journalists we have information to expose them. Now, The Island and the Daily Mirror have published something I have not said. I only explained my position. With the President and the Foreign Minister I discussed the standpoint of our government. We took certain decisions. MP Dinesh Gunawardena brought up several problems. Then, I said that we were of the same view and I would make a statement in Parliament. We support the Geneva resolution. We will never accept an international war crimes tribunal. I never approved the Rome Statute. Sovereignty lies with the people according to our Constitution. Our Supreme Court is one of the oldest in the world. Our Constitution has specified how the members of the Supreme Court are appointed. Judges have to be Sri Lankans. We cannot go against that provision. Those who come to the Court under the provisions of the Constitution should accept the ruling of the court. If foreigners come to appear for some others they should first obtain the permission from the Supreme Court. If the court permits them we cannot do anything about it. Giving them permission is not our task. We have to obtain the assistance from Japan, South Africa and other countries. The President is of the opinion that we do not need to obtain the support of many foreign countries and we can get this done with the lawyers in Sri Lanka. We should discuss this. This is not the first time foreign assistance has been sought. Three foreigners were included in the Paranagama Commission. Now, what is the problem with The Island and the Daily Mirror? They are waiting to see that this government collapses. That is only wishful thinking. That would not happen. That is their hope. What can I do? There is no problem with regard to the national anthem. It is the Constitution that provides for the anthem to be sung in Sinhala and Tamil. We cannot decide against it. I ask you to read the Constitution first. There are some who went on hunting and they used to tell me to go home in the past. Now, the situation has changed. It is time for them to go home. We should remedy the shortcomings in the police Department and the judiciary. I call upon the journalists to join us, but first they should get their hands cleaned. There are journalists who always fought for their rights. They are a strength to us. Do not hunt them to cover your mistakes. We are going to strengthen the police and tri-forces. We will never betray the forces. But, what happened during the war should be investigated. That is not a decision we made. That decision has already been made and we only gave our consent. We need a Truth Commission. The killing of Lasantha Wickremathunga was not a war crime. Is it wrong to investigate that? We did not go to Geneva in 2009 and tell them to investigate this. We did not ask for the Darusman report. Those who call for them cannot consider them wrong now. If they are wrong, those who called for them could go and jump into a river without promoting racism. Paranagama commission had foreigners. But that is not a court of law. They only can investigate and report. But here Ranil is talking about creating a special court of law with foreign judges. Can our prime minister understand the difference between a commission and a court. Media freedom, freedom of expression are the promised values of Yahaplanaya. For example Prageeth Ekanaligoda was accused of helping the terror outfit LTTE. In the same manner here PM is accusing individuals for promoting racism as journalists. PM this not the spirit of ‘Yaha Palanaya’!!! Talking of ” hands aren’t clean ” ? People have not forgotten the Batalanda debacle though the JVP the grieved party has. Ranil is on a witch hunt. Is that the reason why you set our own police force with extraordinary powers! Incidents that took place in Ferguson, Chicago or London are obvious and is no way comparable to what happens in SL. There has been no instance where the police have been found persecute Tamils nor Muslims fomenting racial strife. It is always a case of police attacking the Sinhalese. The simple reason they are political. The only common factor is that it is police that leads the evidence against the police there they will never perjure police action. The ordinary PC which makes up almost 95 percent of the force the cop on the beat is under paid and at the but end of the magistrates and politicians and forced to serve as opposed to follow the rule of Law. In the final analysis you claim that the shortcomings of the Courts and the Police ought to be remedied and wants the media join this endeavour! The newspapers depend on sales and advertisements for their survival. Further they are not free to publish anything contrary to the political whim which is censorship. More often than not guys who report on politics are guided by the censors even though yapalanaya claims freedom of the press, Ranils main concern at the moment is the population is becoming increasingly hostile to the government becos its action. He names Ven Gnanasara of inciting racial violence and quotes various incidents as had been reported by the press a press that has no credibility yet he endorses their claims. Even the Homagama incident people are not certain as to what exactly happened even the `magistrate’ assigned to Ven Gnanasara has requested the AG to acquit him form this case! Obviously these magistrates are tuned into try kassippu cases adultry and domestic violence and their law books dont carry anything beyond. Paranagama commission, three foregners and what purpose did the foreigners most likely expatriate lankans! Some bloggers have gone bonkers. Sri Lanka’s Police Force is one of the most corrupt in the World. I know several who place a LKR 1000 note in their driving licences when flagged down for an offence. A kassippu mudalali who murdered my friend’s family because they complained about his illegal activities to the Police, is still living a free man because of his ‘connections’ in the Police force. The Embilipitiya incident resulted from ‘excessive use of Police Power’. RW is sticking his neck out highlighting corruption; I fear his life. Zama says our Policemen are underpaid. Disagree. Public Servants are paid what the Government can afford. If the salary of a Policeman is increased to LKR 50,000 per month, he will continue to seek bribes to buy that luxury car which his neighbour, the kassippu mudalali drives! A worker who carries bags of wheat for 8 continuous hours in the harbour is paid LKR 1,200 per day. That is because the system allows only that amount to be paid. The Paranagama Commission is a dead duck. It does not meet with any international standard for the work it is undertaking. The only silver lining in the dark cloud is the appropriate implementation of the law by some of our Magistrates. That’s pretty heartening. Zama’s comments about the knowledge of our Magistrates being confined to kassippu cases adultery and domestic violence is disgusting. Our magistrates are masters of the legal profession. They know the law inside out and upside down. It is comments like Zama’s that is making UNHRC insist on international observers. We all know who is sponsoring Ven Gnanasara and for what purpose. There are some people in this country who cannot live without ‘political power’; they need political power to perpetuate corruption and claim immunity from prosecution.